Logitech UE Mobile Boombox review | What Hi-Fi? 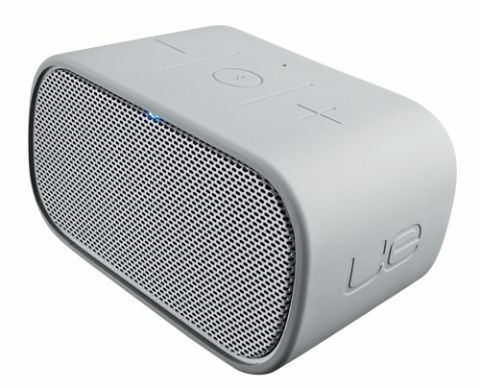 At under 7cm wide and less than 12cm deep, the Logitech UE Mobile Boombox manages to make even other portable Bluetooth speakers, such as the JBL Flip and iLuv MobiOut, seem bulky in comparison. Despite this, there’s also something reassuringly rugged about the Logitech UE Mobile Boombox's compact stance and rubberized casing. On the back of the speaker is a 3.5mm socket, a micro USB input for charging the Mobile Boombox’s built-in rechargeable battery and a small power switch. Logitech claims an impressive 10 hours of battery life when it’s fully charged and a 50ft wireless range, again making it a stand-out in the portability stakes. Last but not least there are soft-touch volume and pairing buttons on top of the speaker. The laws of physics dictate you’re never going to fill even a medium-sized room with the sound from a product as small as the Mobile Boombox, but the speaker doesn’t embarrass itself. There’s fine detail for the money and, like the iLuv, the Logitech extracts enough of the musical DNA of a track to convince you to keep listening. Prince’s 1999, for instance, could be delivered with greater gusto and have more meat on its bones, but the Logitech still manages to capture the rhythm and swagger of the tune. Over the past few years, Logitech has shown it’s a dab hand at designing and executing portable speakers. The Logitech UE Mobile Boombox isn’t going to give you room-shaking dynamics but it’s good enough, and the flexibility and sheer portability on offer makes it a good shout for your pocket and wallet.